The Niklas offers great flexibility and functionality which benefit user and carer alike. 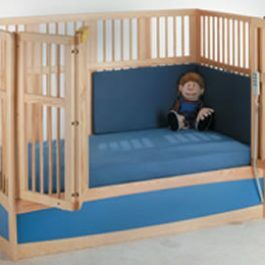 Dependent upon options, the bed can be accessible from all four sides, as each side can be lowered independently and the corner posts can be removed. This provides an excellent “platform” for rehabilitation and physiotherapy needs. 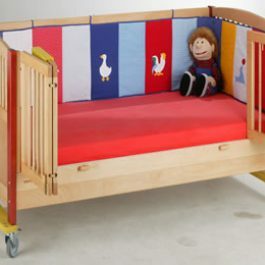 The Savoir-Vivre cot combines safety and comfort to bring a solution for many in a caring environment. 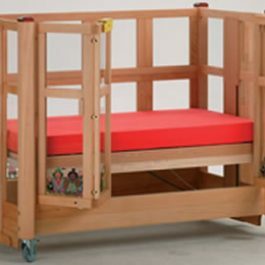 The variety of size and side height options enable carers to make a pro-active decision when selecting a care cot. As with all care cots in the range the Savoir-Vivre can be adapted to provide you with a non-profiling option if required. The safety and security afforded by the Savi Tom provides exceptional therapeutic support. 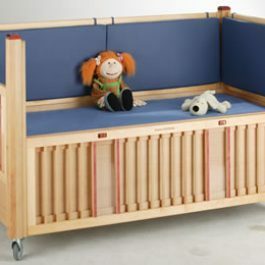 The combination of the beech wood design and Perspex sides ensure that high visability into and out of the cot are maximized. Due to the low entry height (approx 30cm), access is available to all who are able to self transfer.